Tablets are facing a steady decline, with the tablet market registering negative growth figures in 2015. Even within this declining market, Apple continues to rule as the number one tablet manufacturer, with Android and Windows-based tablet makers trailing behind. Chinese manufacturer Lenovo sits in fourth place, with a market share of just over 5 percent. This brings us to the question: are Android tablets even relevant anymore? 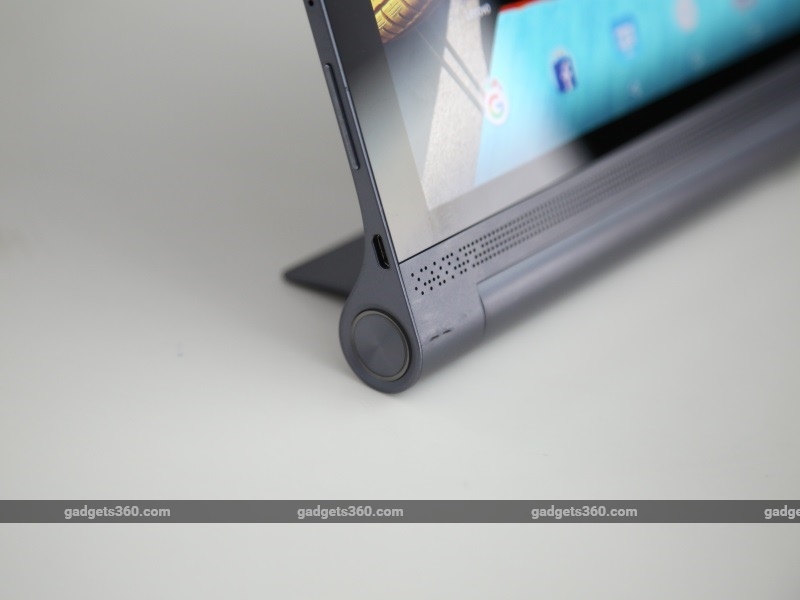 Lenovo sure thinks so, based on the fact that it just launched the Yoga Tab 3 Pro in India. First unveiled in September last year, the Yoga Tab 3 Pro doesn't look like any other Android tablet. It has its own in-built projector, along with Dolby Atmos tuned speakers and a unique stand that gives it the ability to be used in various positions. 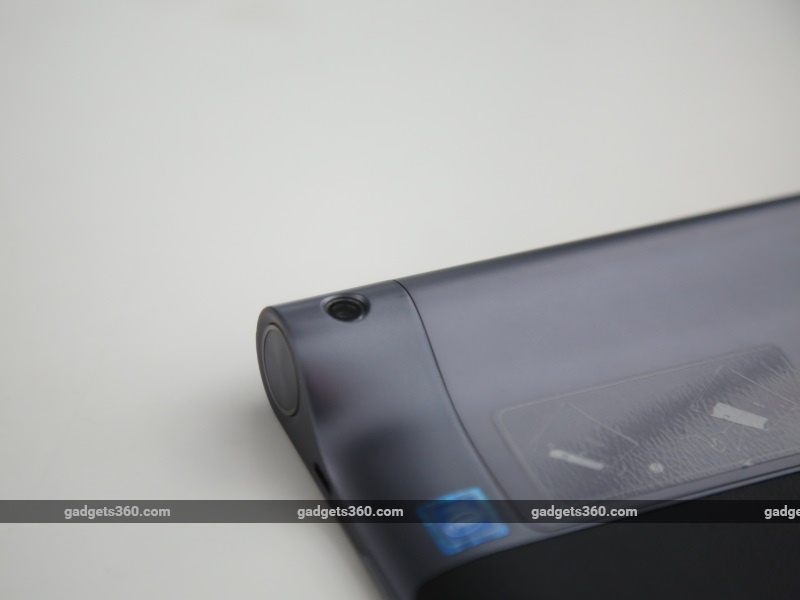 We go in-depth with the Lenovo Yoga Tab 3 Pro in our review. 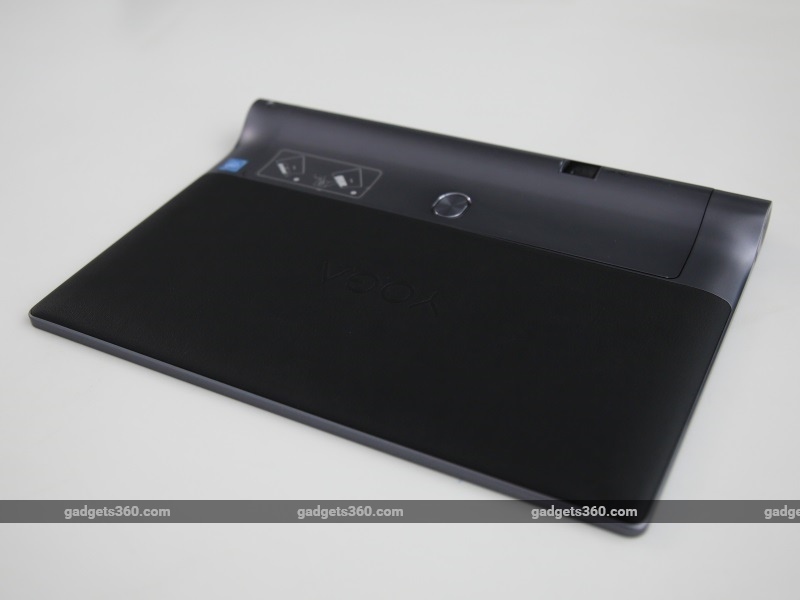 Lenovo's Yoga tablet range has always followed a consistent design language. The Tab 3 Pro sticks to this, with a cylindrical base and stand that lets the tablet be positioned upright or slightly angled when flat. When you don't need the stand, it can simply be folded back into place and clicked shut. A physical button at the back can be pressed to unlock the stand when needed. A small flap under the stand hides the microSD slot. Some global variants of this tablet also support cellular data connectivity, and those variants have a SIM slot under this flap as well. 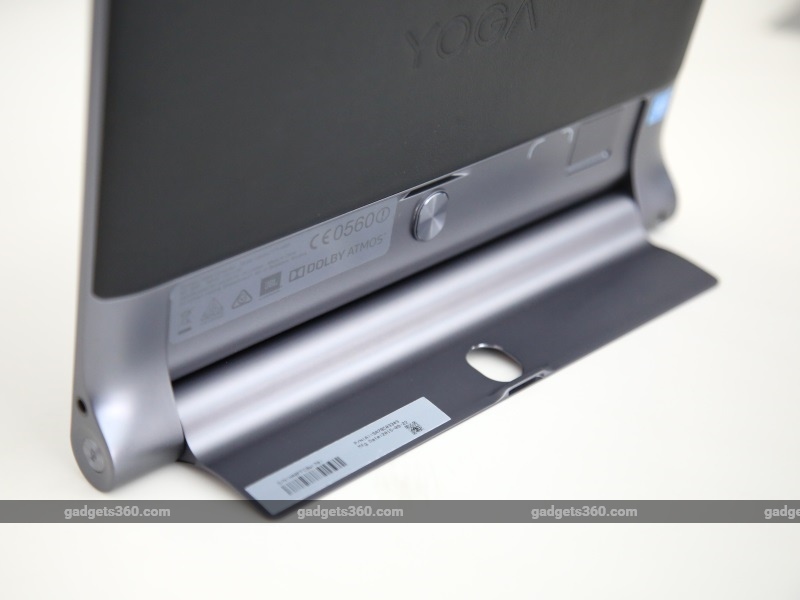 The Yoga Tab 3 Pro's signature feature, the integrated projector, is built into the stand. This essentially allows you to adjust the angle of the projector's throw and still use the tablet easily while it's projecting, which could be particularly useful during presentations. The camera is on the base, but to one side of the swiveling stand, and therefore can't be angled the same way. That shouldn't be much of a problem since you likely won't be taking many pictures using the Yoga Tab 3 Pro. The Lenovo Yoga Tab 3 Pro isn't a small device by any means. It's got a large 10.1-inch screen and weighs a hefty 665g. It's naturally a bit heavier at the base, so it isn't quite as easy to handle as many other more balanced tablets. The left side has the power button, Micro-USB port and volume rocker, while the left has the projector button and 3.5mm audio socket. The front of the device has the secondary camera and Dolby Atmos-tuned JBL speaker array, comprised of four individual speakers, sitting right below the screen. The screen itself is quite an impressive one, with a 2560x1600-pixel resolution and density of 299ppi. It's fantastic when it comes to brightness and colours, and is incredibly sharp at typical viewing distances for tablets. This makes the Yoga Tab 3 Pro an excellent option if you intend to use it for watching a lot of movies and TV shows. The Lenovo Yoga Tab 3 Pro is powered by a quad-core Intel Atom x5-Z8500 SoC, clocked at 2.24GHz. There's also 2GB of RAM, 32GB of internal storage (expandable by up to 128GB with a microSD card) and two batteries: a larger 6200mAh unit and a smaller 4000mAh one, totalling a massive 10,200mAh of battery capacity. The version of the Yoga Tab 3 Pro that has been launched in India is the Rs. 39,990 YT-3X90F variant which does not have cellular connectivity, although the cellular variants have been listed on Lenovo's India site. Apart from this, there is also Bluetooth 4.0, Wi-Fi a/b/g/n/ac and GPS connectivity. Included in the package is a USB cable and a 24W charger, which charges the tablet fairly quickly despite the large batteries. 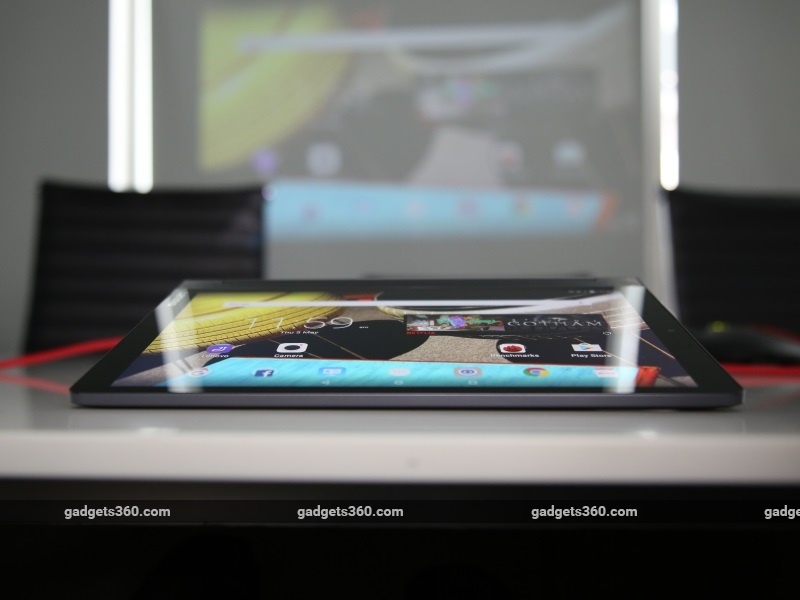 The Lenovo Yoga Tab 3 Pro runs Android 5.1 with a customised user interface on top. It's a two-layered UI that has visual similarities to Lenovo's Vibe UI for smartphones, although some small tweaks have been made to optimise the interface for the larger screen. Apart from Lenovo's own apps, you also get Netflix pre-installed, signifying the tablet's intended use as a media device. On the whole, the interface is essentially a large-screened version of what we're used to seeing on Lenovo smartphones. Key apps worth going into detail about are the projector app, the Dolby Atmos tuning app, and Lenovo Sketchpad. The projector app lets you control the projector and choose videos, pictures and documents to view, but we found it easier to simply switch on the projector using the hardware button on the side or the toggle in the quick settings panel, and then navigate through the interface to find media. However there are some settings which you will need the app for, including focus tuning, brightness, and keystone correction. The Dolby app lets you activate the virtual surround sound mode, as well as tweak the equaliser as you see fit. The Sketchpad app lets you draw on screen, which will come in handy when using the projector for demonstrations and presentations. The Yoga Tab 3 Pro is one of a small number of modern tablets powered by the Intel Atom x5-Z8500 SoC, and we registered 79,372 in AnTuTu. Graphics benchmarks also produced decent scores, with 25fps in the T-Rex test in GFXBench and 24,773 in 3DMark Ice Storm Unlimited. However, performance in actual practice is unreliable depending on the task you're putting the tablet through. Games, for example, suffered because of stutter and lag. This was the case with a variety of games, whether light or graphically intense. Rebooting the tablet solved the problem for a while, but it cropped up again each time. On the other hand, videos weren't a problem at all, loading and running perfectly whether stored on the device or streamed. This included excellent performance with Netflix, which was a pleasant experience thanks to the screen. Battery life is decent as well, and the tablet ran for a little over 13 hours in our video loop test. In ordinary use, you could use it for up to three days at a stretch depending on how often you power up the power-hungry projector. Another key aspect that makes the Lenovo Yoga Tab 3 Pro an excellent media tablet is its built-in speaker array. The four front-firing JBL speakers and Dolby Atmos tuning make for an interesting sonic experience that's loud, open, wide and clean. The design is to some extent like a miniature soundbar, because of the length of the speaker array and its position right below the screen. Atmos mode has a slight effect on the sound, by widening the throw, but it does not create any sort of surround effect as you would expect from the Atmos name. Either way, the sound is superb for a portable device. You could easily do away with headphones in the right environment, thanks to the loud, clear sound. 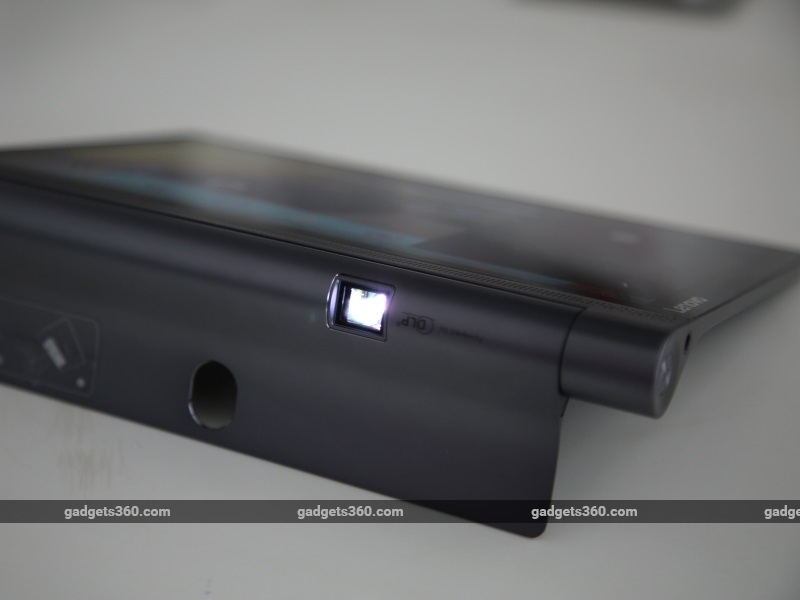 The Lenovo Yoga Tab 3 Pro has a 13-megapixel primary camera and 8-megapixel front camera. You aren't expected to take a lot of pictures on a tablet, and you'll likely look a bit silly if you hold a giant slab up to take pictures when you're out and about. Despite that, the camera is surprisingly good for a tablet, taking pictures that are sharp and detailed in proper light. The front camera is also decent enough for video-conferencing and the occasional selfie. Finally, moving on to the big feature of the Lenovo Yoga Tab 3 Pro, we gave the projector a trial. Triggering the projector is fairly easy, and can be done either using the dedicated projector button, the quick settings toggle in the notifications shade, or through the projector app. The projection is fairly bright with a maximum brightness of 50 lumens, but it will need a dark room to be seen properly. 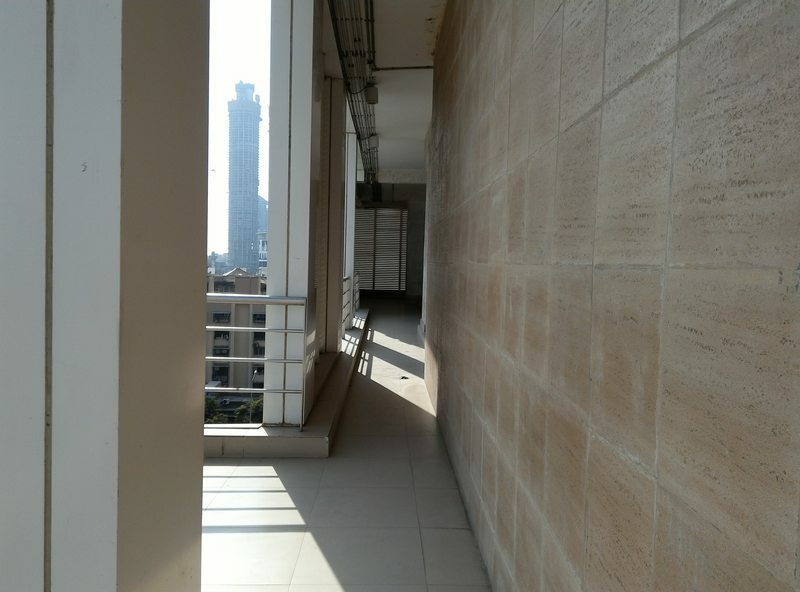 It projects to a maximum size of 70 inches, but visibility and quality is best at around 25-30 inches. Projection size can only be adjusted by physically moving the tablet towards or away from the screen or wall you're using. However, brightness and keystone correction can be controlled, as well as focus (all of which are on-screen and software-based). The projector resolution is quite low at 480p, and images are naturally lacking in sharpness. If your intended use for the projector is the occasional presentation or periodic group video watching, the Yoga Tab 3 Proshould be fine. However, you should stick to the tablet's excellent screen for most of your personal viewing needs. The Lenovo Yoga Tab 3 Pro is primarily a media consumption device. It has a big, sharp screen, excellent speakers, decent audio even with headphones, and a built-in projector that will come in handy for presentations and the like. It looks good and has decent battery life. The adjustable stand means that you can position the tablet however you like, and there's even a decent set of cameras. For the very specific purposes that use these attributes, this is an excellent device. However, it is not an all-rounder of a device, and it will disappoint you in other ways. Poor performance is its greatest weakness. It simply does not live up to expectations for Android devices, with sluggish performance and lag throughout the system, particularly when playing games. If you intend to use this device primarily for presentations and media consumption, or if you have other gadgets for the other purposes, then the Yoga Tab 3 Pro should suit you just fine.